Printed music for the guitar can be notated in several ways. One way is standard notation, which looks like printed music for any other instrument. The guitar actually sounds an octave lower than it’s written, which avoids having to use two clefs to notate. See the example below for the range of the notes on the guitar. In this example, the guitar song notes are on a traditional music staff. Guitar song notes can also be written in tablature format, which you’ll often see shortened as TAB. This is a specific notation used for guitar and other stringed instruments. In tablature for guitar, the neck of the guitar is represented by six horizontal lines indicating strings. Numbers on the lines indicate the frets to be played. Guitar tablature is a popular way to write and read guitar song notes for guitarists who find it much easier to understand than traditional notation. In guitar tablature, there’s typically some information missing that you’d get with traditional music notation. Most guitarists using TAB already have an idea how the song sounds, so they don’t need to know the rhythms and note length values, which are not normally shown in TAB. More advanced TAB does, however, use the same note tails as the traditional music notation. Another way guitar song notes are indicated is by a system called the Nashville Numbering System. This system doesn’t address single notes, so you would need to use TAB or standard notation for reading melodies and solos, unless of course you’re just improvising over a chord progression like so many Nashville players do. 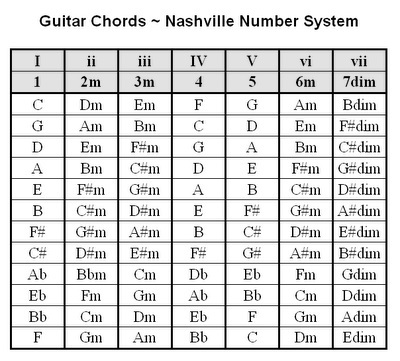 In the example below, you can see the Nashville Numbering System is simply a way to indicate chord progressions in any key. Before you attempt to read any kind of guitar notation, it’s a good idea to get familiar with where written guitar song notes appear on your guitar. Check the chart below to get an idea where these notes can be found on your fretboard. One thing you’ll notice is that the same note at the same pitch can be found in more than one place on the guitar. The open A string (5h string) is the same note and pitch as the fifth fret on the sixth string. See the diagram below to see the repeated notes and pitches as cycles. A good way to hear the notes is to play a few scales and listen for notes that sound the same at the same pitch. After a while you’ll be able to associate guitar song notes you read with what you see on the printed page.